All-around protection never looked so good. 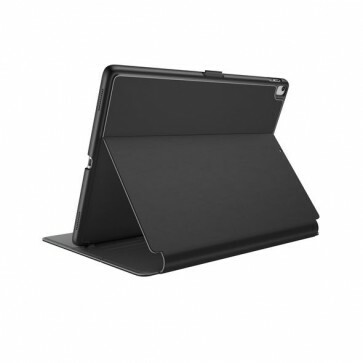 Balance FOLIO’s superior slim design looks great and protects your 9.7-inch iPad from drops up to 4 feet. The case’s hardshell perimeter protects against drops, while the soft liner guards against scratches. The hardshell creates a raised edge around the screen, offering added protection from drops and other damage. Balance FOLIO’s cover recesses into the case, creating a slim profile that doesn’t sacrifice protection. Magnets built into the cover automatically activate and sleep the screen when you open or close it. Plus, a secure clasp keeps the cover closed when you’re not using your 9.7-inch iPad. Balance FOLIO is made from durable, easy-to-clean polyurethane materials that resist heavy abrasions so the case stays looking great through years of use. An adjustable stand offers multiple viewing and typing angles, so you can binge on your favorite shows or get work done. Like all of our products, this 9.7-inch iPad case has been lab-tested against extreme temperatures, cracks, chemicals, and abrasions.